Melissa Mang is about to start a new chapter in her life. The New Orleans native is finishing up her career as a junior tennis player and getting ready to be a college tennis player. She is more than ready for this change, but that doesn't mean she's going to leave the world of junior tennis quietly before she's off to Duke. In her final year of girls 18s, Melissa began with a win at the K-Swiss Championships and continued with the fourth place trophy at the USTA National Spring Championships. It was a fitting start to follow a year that included a host of top finishes in National tournaments, including a doubles title (National Open) and singles final. For Melissa 2003 was even better, featuring one national and one international championship. As early as 1999, at age 12, Melissa Mang was making herself noticed with a host of sectional championships and national wins at the Junior Spring Fling, Gator Bowl and National Hardcourts. She would continue this run, adding trophies in the following years from National Opens, Super National Claycourts, Winter Championships and the Easter Bowl. 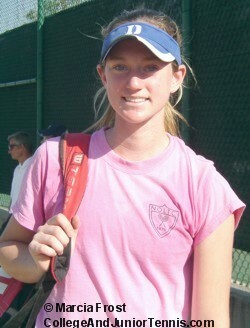 I sat down with Melissa Mang at the USTA National Spring Championships. She had just lost the third place playoff, but it definitely wasn't getting her down. A: "I'm not sure. I really don't know." Q: That's alright. What tournament did you have the most fun at? A: "I loved Fed Cup. It's just before Hardcourts and it's my favorite tournament. It's a team event so it's really fun."